The office town of Niederrad is changing, due to numerous residential projects. The transformation of such a large formerly purely office quarter into a mixed district is unique in Germany. It was reason enough for Lord Mayor Peter Feldmann to visit the former office town of Niederrad at the invitation of the site initiative “Neues Niederrad” (SINN). “The Lyon Quarter is a model example for the successful revitalisation of commercial quarters,” Feldmann said after an hour tour on Monday 21 August. At the beginning, the Lord Mayor had unveiled a large banner with a new banner and the salutation “Salut im Lyoner Quartier” (salut in the Lyon Quarter). In addition to the welcome greeting, the banner informs about the latest development project “Living Lyon” by the Swedish project developer Catella. The living ensemble offers 123 modern units for all generations. “I am delighted that Catella is building rental apartments for singles, couples and families of all generations, because such apartments are especially scarce in the Frankfurt housing market,” said Mayor Feldmann. 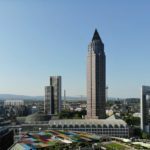 In return, Catella Managing Director, Klaus Franken paid tribute to the decision of the district council and the magistrate by renaming the office town of Niederrad in the “District of Lyon”. “For new citizens who are moving in here, this is important to be able to identify with the district,” says Franken. The joint tour with the Lord Mayor, the members of the SINN and the district council 5 led to further housing projects. Among them was the “Pianocourts” of BIEN-RIES AG with 336 smaller and larger rented apartments, Hahnstraße 24 / corner Goldsteinstrasse. The investor is the Munich-based GBW Group. 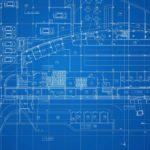 The first section is expected to be completed by the end of the year. Then we went to Hahnstraße 37-39 and 41. There, Max Baum Immobilien is building two residential and commercial buildings with 165 apartments as well as a food market, a discounter and a drugstore market for the ABG Holding in Frankfurt. Next stop was the project “Green Gate”. Project developer 6B47 is planning some 700 rental and owner-occupied apartments on Lyoner Strasse 52 on the outskirts of town. 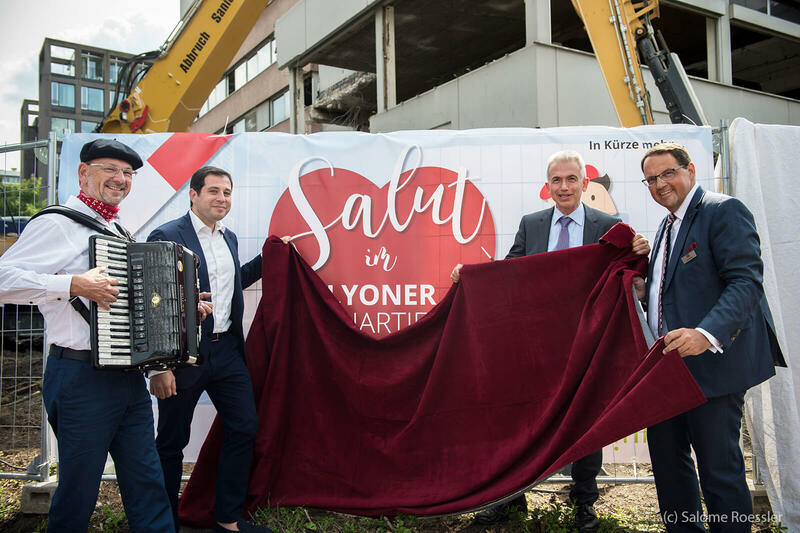 The new SINN members, the housing associations GWH (Lyoner Strasse 38) and the company group Nassauische Heimstätte / Wohnstadt (Hahnstraße 46-48) are developing further housing projects. The Nassauische Heimstätte has already begun to evacuate the old computer centre. On the property, around 200 apartments of varying sizes, including a 30 percent subsidised housing area, will be built in 2019. According to the city’s latest forecasts and the SINN location initiative, up to 8,000 people will move into the District of Lyon over the next 18 months. 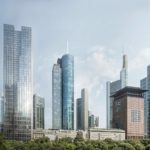 That would already be 2,000 people more than the Frankfurt city planners had calculated a few years ago: “For the city of Frankfurt, the former office center thus becomes a promising building block for residential space,” explained Peter Feldmann. An office space with 25,000 workstations also has a lasting effect. New companies such as the Spanish pharmaceutical company Grifols and the French Premiere Classe hotel have settled down, and long-established companies such as Siemens have merged their scattered sites in the District of Lyon. “At the Büromarkt we expect a full letting over the next two years,” said the chairman of SINN, David Roitman. “If one removes vacant office buildings, which are demolished or turned into residential buildings, the effective office vacancy is now already five percent. This is significantly less than the Frankfurt average. The companies appreciate the advantages of the district, especially the good connection to the airport and the main station, ” said Roitman. “We are delighted that the city is following our inspiration and is considering a green space concept. The topics of transport and primary school must also be addressed promptly. Local council and magistrate, SINN as an active partner will always be at their side, “said SINN chairman Roitman. In the picture: Lord Mayor Peter Feldmann (2nd from the right) during his visit to the Lyon Quarter, next to Catella’s managing director Klaus Franken (r) and the chairman of the SINN board, David Roitmann (2nd from the left). 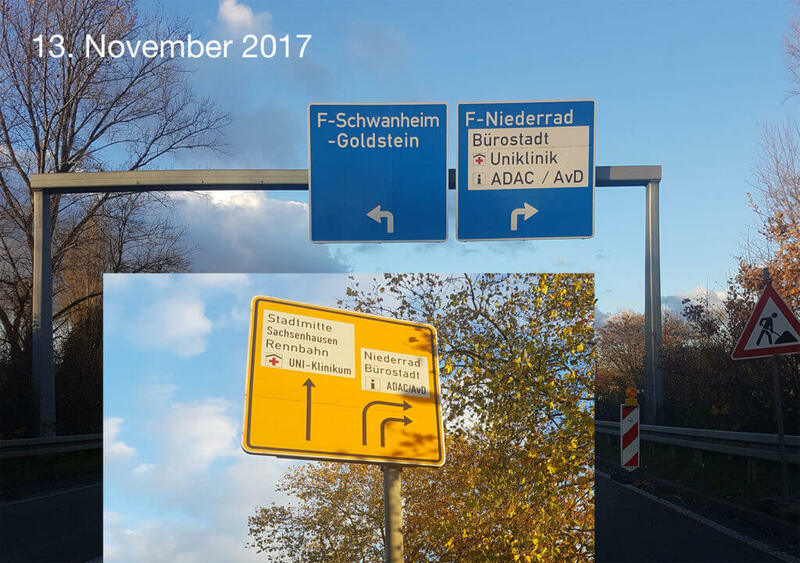 Addendum November 13, 2017: Almost three months after the official renaming of the office town of Niederrad in the Lyon Quarter, all the street signs in the Niederrad area still pointing to the “Bürostadt” (“Office City”) instead of the Lyon Quarter. This circumstance should be resolved as soon as possible!